"Thanks!" to many of you, who let us know the following news. 40% off final sale items. 40% off Wear Right Now items. 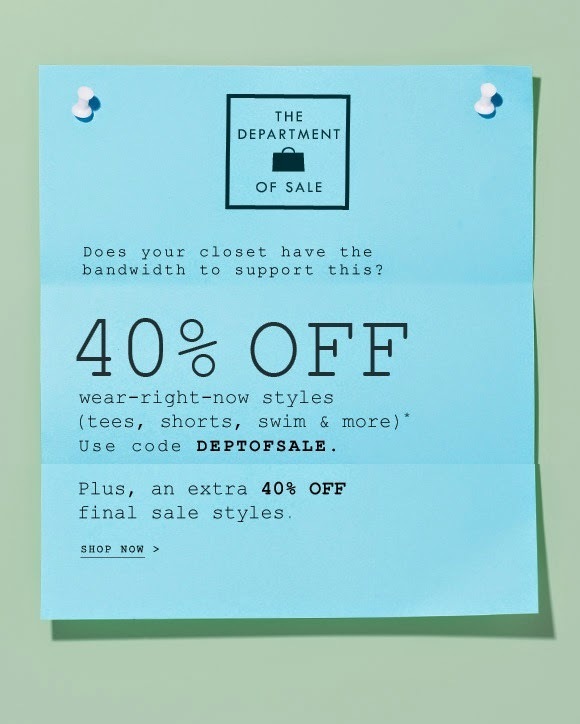 Offers valid on the purchase of final sale items and items marked "40% off with code DEPTOFSALE" at jcrew.com from August 4, 2014, 12:01am ET through August 8, 2014, 11:59pm ET. Offers not valid in J.Crew or J.Crew Factory stores, at jcrewfactory.com or on phone orders. Offers cannot be applied to previous purchases and cannot be redeemed for cash or used in combination with any other offer. To redeem, enter code DEPTOFSALE in the promo code box at checkout. Limit one promo code per order. Offers valid in the U.S. and Canada only. Terms of offers are subject to change. Final sale items cannot be returned or exchanged. Keep in mind that most brick and mortar (B&M) stores are clearing out their sale sections (if they have any left after this weekend). As some of you noticed over the weekend, the sale section ballooned up to over 2000+ items. It was insane the number of pop-backs. Expect to see more instances of merchandise spikes over the next few weeks.